"A Murder At Rosamund's Gate" by Susanna Calkins~New Historical Fiction! In Susanna Calkins's atmospheric debut novel, a chambermaid must uncover a murderer in seventeenth-century plague-ridden London. For Lucy Campion, a seventeenth-century English chambermaid serving in the household of the local magistrate, life is an endless repetition of polishing pewter, emptying chamber pots, and dealing with other household chores until a fellow servant is ruthlessly killed, and someone she loves is wrongly arrested for the crime. In a time where the accused are presumed guilty until proven innocent, lawyers aren't permitted to defend their clients, and--if the plague doesn't kill them first--public executions draw a large crowd of spectators, Lucy knows she may never see this person alive again. Unless, that is, she can identify the true murderer. In her debut novel, Susanna Calkins seamlessly blends historical detail, romance, and mystery into a moving and highly entertaining tale. Educator, historian, faculty developer by day... writer by night...I've had a morbid curiosity about murder in seventeenth-century England ever since grad school, in those days before I earned my Ph.D. in history. The ephemera from the archives--tantalizing true accounts of the fantastic and the strange--inspired my historical mysteries. Born and raised in Philadelphia, I live outside Chicago now, with my husband and two sons. Represented by David Hale Smith of Inkwell Management, my first novel, A Murder at Rosamund's Gate (Minotaur/ St.Martin's Press), will be published April 23, 2013. I'm so thrilled to bring you this very upbeat and exciting interview of Susanna Calkins to kick off her debut novel. Obviously, can't wait for you to meet her!! Thank you so much for allowing me to join you today. These questions were a lot of fun to answer. According to my husband: Motivated, friendly, energetic…open to possibilities and change. 2) Where is your favorite place to write? Any special gimmicks, writing tools or keepsakes that you keep near you when you write…I hear authors can be superstitious! 3) Who first told you you could write well, and how did it affect you? Great question! In sixth grade we had to create stories that incorporated a list of spelling words. I had so much fun writing these stories! I’d make them as scary and mysterious as possible (strewn of course with ridiculous spelling words like “alleviate”). We had to read them out loud each week to the class. Over the weeks, my teacher began to have me read last, and the class would get really excited when it was my turn. They made me feel I could tell a fun story that others would enjoy. 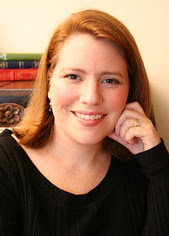 I love a lot of current mystery authors—Anne Perry, Rhys Bowen, Elizabeth George all come to mind—although I also appreciate some YA authors like Suzanne Collins, Tamora Pierce and Shannon Hale. 5) Which are your favorite classical authors? Jane Austen, Louisa May Alcott, Lloyd Alexander and Lucy Maud Montgomery. I’ve read every one of their books multiple times. 6) Jump into any book~which character would you be? Who doesn’t dream of being Elizabeth Bennett? However, I would also love to be Eilonwy from Lloyd Alexander’s Chronicles of Prydain, because she was the original tough tomboy princess. 7) If you could have 5 historical people to dinner, who would they be? What would you have to eat? For pure crazy entertainment, I’d go with Nell Gwyn (17th century actress), Ben Franklin (although I’d have to keep him from Nell), Malcolm X, Houdini and maybe Dorothy Parker! I’m confident they’d like to eat Indian food and Kingfisher beer. What do you think? J Love it! Growing up in Philly, going down the shore was the highlight of the summer. Although I live on beautiful Lake Michigan now, my heart is still with the Jersey shore. Ah so tough! Currently, Bones and Nikita, but Battlestar Galactica and Alias are all-time favorites. I’ll give you three: Breakfast at Tiffany’s, Pride and Prejudice (A&E with Colin Firth) and to be honest, The Deathly Hallows Part II (a pretty perfect culmination of an epic series). 11) Are you working on a new book? I am working on TWO new books. One is the second Lucy Campion novel, tentatively called From the Charred Remains. (I really don’t think that title will stay though); I am waiting for feedback from my editor. I am also nearly finished a YA novel, which I hope to submit soon. 12) Anything else I forgot to ask you? Thank you so much for having me! I would love to know which 5 characters YOU would invite to dinner! And what your readers would say too! 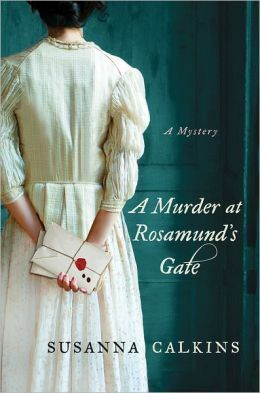 "A Murder At Rosamund's Gate" is a most refreshing historical novel replete with its mystery and mayhem. While the beautiful cover suggests it is more centered around a ladies maid, the novel itself is broader in perspective, making it the perfect introduction for more books in a series. I thoroughly enjoyed the story and the characters. Susanna Calkins is a wonderful author of this time period! Ms Calkins peppers her writing with knowledge of the Reformation and the idiosyncracies of the people and times. For instance, I loved the small peculararities of women's clothing and customs she brings out...some of which I hadn't heard of even after all my reading of historical fiction! Also, there were rhymes and notes of interest throughout the book that made my eyes and ears perk up with new knowledge. I really appreciated the reference to Anne Bolyen and London Bridge, as an example. You'll have to read to see this one! The characters of this book are beautifully drawn and ring true. There is enough depth in them that they will be more than worthy of a series. I'm particularly attached to Lucy and her loyal ways. She's a thinker and a true heroine in the broadest sense. I think she'll find a fast following with those who love a mystery series in historical timeframes. Susanna Calkins is a writer who carries you gently through her novel of mystery and suspense. She builds her story carefully and creates an atmosphere in which you learn her characters' strengths and weaknesses. You learn to love them and to know them before she sets them in real jeopardy. I like this sort of suspense-building in a book. I think the historical fiction mystery genre has a new player to contend with! This is a novel to sit back and enjoy. I look forward to the next one in the series.